In His Bid to Quit Smoking. As far as vaping is concerned, I suppose the Chinese idiom 活到老，学到老huódàolǎo,xuédàolǎo rings true. One is definitely not too old to learn and in this case, I've just learn about vaping. Vaping comes from the word vape. It supposedly had been in existence since the 14th century but it is only recently that I learn about this alternative to smoking and what people called the electronic cigarette. That was when news on vaping hog the limelight in the local media. While vaping has been hyped a business dominated by Malays in Malaysia, the electronic cigarette is not really a Malay creation. 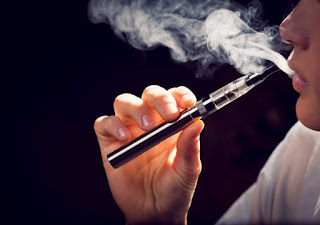 In 1963, American Herbert A.Gilbert had already patented a smokeless non-tobacco cigarette but it is a Chinese pharmacist, an inventor and a heavy smoker, Hon Lik or Han Li ( 韩力) who, in his bid to quit smoking, came out with the modern e-cigarette. Since the health hazards of e-smoking is not yet known, probably it's not time yet to thank Hon Lik. Touch wood!